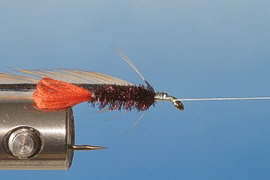 The Red Tag is always a good choice, be it as a dry fly or as a nymph. 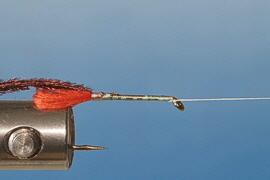 If you want to tie it as a nymph, you have three choices: you can use lead wire only to get it down, or use beads of brass or tungsten. 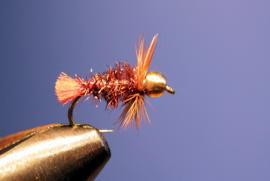 Here you will find a fly tying instruction for the Red Tag by Wolfgang Fabisch. 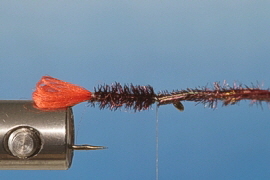 Used materials: Hooks, tying and body thread, fibers of peacock herl feathers, hackle feathers and maybe beads. Tie on your Dyneema fly tying thread and cover your hook shank with nice touching turns. 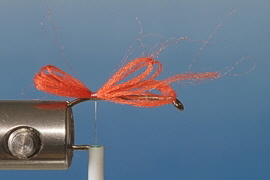 Next take some multifilament red body thread and fold it over a couple times, depending on your hook size. Tie this in at the hook bend. 2) Cut the surplus material pointing to the front at an angle and wrap your fly tying thread over it. The material pointing to the rear will form the tail, which is supposed to be rather bulky. 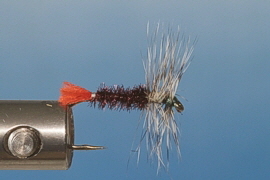 3) Tie in three fibers of peacock herl feathers right at the tail and bring your fly tying thread up to the eye. Make sure your herl is tied in well. Twist your herl together, and pay attention, peacock herl can be very fragile! 4) Now wrap your twisted peacock herl fibers towards the eye, leaving the last 3 mm to the eye free. Tie down and nip off excess. 5) Tie in a brown hackle feather in front of your peacock herl, Bring your thread up to the eye, wrapping it over the stem of your hackle. 6) Now is the time to trim the tail. It should come out flush with the hook bend or slightly longer. 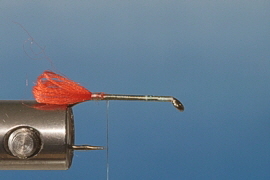 Next, wind three to five turns towards the eye with your hackle, tie it down, whipfinish and nip off the excess. Done! to secure the whipfinish, I use a permanent marker instead of head cement. 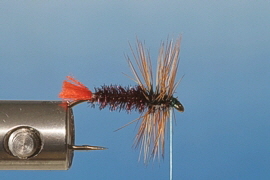 7) By using a grizzly hackle instead of a brown one you end up with another pattern called the Witch. Both patterns can be fly fished in all conceivable ways: greased as a dry fly, without grease as a wet fly or emerger, or weighted as a nymph. In the weighted versions you have a choice of just using a little bit of lead wire on the hook shank, a brass bead or a tungsten bead, and additional lead, if wanted. 8) Even as a nymph, both the Red Tag and the Witch are always a good choice. Whether you use beads of gilded brass or of tungsten depends on the water you intend to fish. For shallow stretches a layer of led wire will do. Amazingly, I have been catching better and better with untreated brass pearls over the last years. These pearls darken slightly after being fished. This may even get close to black. Well, the heads shouldn´t be black, but in places with high fishing pressure the matte versions seem to be more successful than the high-gloss versions.